We don’t hear much about monofilament line anymore. That’s understandable in some ways, I suppose. Fluorocarbon and the new braids are taking over. However, the real story is much more complicated. Monofilament still has a place in serious bass fishing, even if it’s a somewhat limited one. The reason it still has a place in our sport is because it has some qualities that, when put together, no other line can duplicate. For openers, it’s buoyant. It floats. Another thing is that it has stretch. Sometimes that’s a real advantage. And last, but not least, it has low memory when compared to fluorocarbon. We’ll talk about when these qualities matter in just a second. In the past when we talked about quality monofilament we were pretty much talking about Berkley Trilene XL and XT. 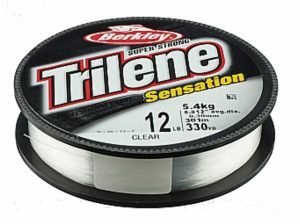 But now any serious discussion about monofilament line must include Berkley Trilene Sensation Professional Grade. It’s the real thing. It’s strong, has excellent knot strength and has a very low memory. If you haven’t tried it, I suggest you buy a spool. You’ll see immediately what I’m talking about. 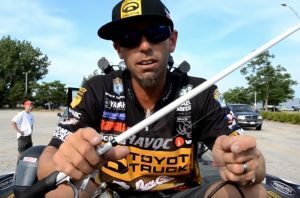 We want our topwater plugs to stay on top. The easiest way to do that is to fish them with a line that floats. Monofilament does that. Even when I’m using braid on top I mostly tie a monofilament leader to it. There are times when we don’t want our plugs to reach their maximum depth. Sometimes, like when you’re fishing over brush or weeds, we want them to stay high. Monofilament will help with that. I’m talking primarily about square bill crankbaits, lipless crankbaits and wake baits. These baits all need to bounce off of cover and structure with sharp, erratic movements. Monofilament, with its stretch and its floating properties, is the best line to do that under real fishing conditions. Remember something: We caught thousands and thousands of bass with monofilament lines back in the day. Is there any reason to believe we can’t keep doing the same thing?